SIMATIC is the worldwide established automation system for implementing industrial control systems for machines, manufacturing plants and industrial processes. Relevant open-loop and closed-loop control tasks are formulated in various programming languages with the engineering software STEP 7. Ladder diagram (LAD) and function block diagram (FBD) use graphic symbols to display the monitoring and control functions similar those used in schematic circuit diagrams or electronic switching systems. Now in its fifth edition, this book describes these graphic-oriented programming languages combined with the engineering software STEP 7 V5.5 for use with both SIMATIC S7-300 and SIMATIC S7-400 automation systems. New functions of this STEP 7 version are especially related to CPU-Webserver and PROFINET IO like for example the application of I devices, shared devices and isochrone mode. It is aimed at all users of SIMATIC S7 controllers. First-time users are introduced to the field of programmable controllers, while advanced users learn about specific applications of the SIMATIC S7 automation system. All programming examples found in the book - and even a few extra examples - are available over the publisher's website under Downloads. HANS BERGER was a very experienced developer of automation systems and software and is still just a most successful author of technical books. He has published more than 30 books on automation technology. Including all editions in English, German and Spanish, his total book record comprises more than 75 editions. Anyone involved with exploring the world of Step7 would do well with this book. 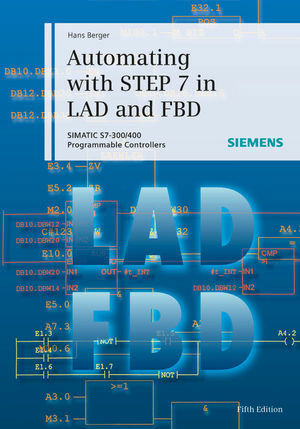 If you program with Step 7 or plan to, this book will save you a lot of headaches since little in Step 7 is as intuitive as Allen Bradley or Modicon.